My farewell post for the “Process” column is a brief conversation with Jahan Ramazani, University Professor and Edgar F. Shannon Professor of English at the University of Virginia, and a scholar whose work I admire greatly and follow closely. He gives serious attention to strong poets who aren’t always read with such insight, as well as leveling powerful arguments about how verse frames identity, feeling, and nation. In short, his labors help me think through scholarly problems and build syllabi—plus, since he writes accessibly, I’ve brought excerpts from several of his books into undergraduate classrooms with great success (next week’s assignments for Introduction to Poetry include a section on song from Poetry and Its Others, paired with a visit from W&L singer and composer Dana Gary). I hardly ever see Jahan, although he works in Charlottesville, just an hour’s drive over the mountain, so it was a treat to have this official reason for questions about research, process, and politics. We conversed via email, although I prefer to think of us calling rhymes across the Blue Ridge. 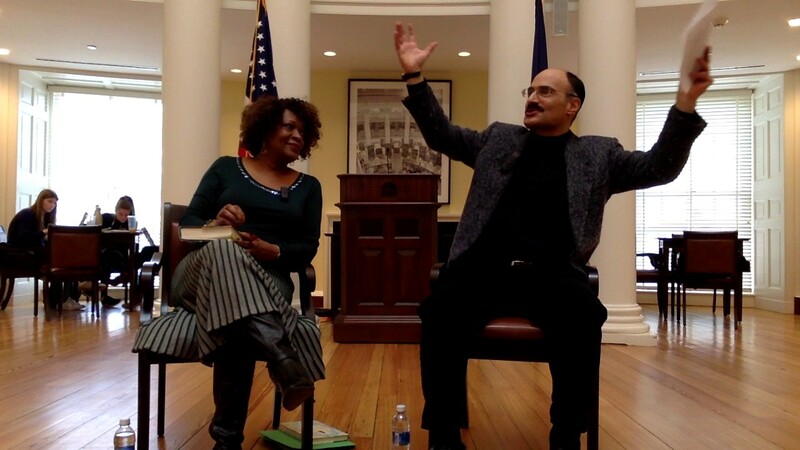 Jahan Ramazani interviews Rita Dove at the “What is a Poem?” symposium sponsored by the Center for Poetry & Poetics, University of Virginia, March 2017. A year later, we’re still awash in resurgent xenophobic nationalism. Scholarship is slow, but do you find contemporary politics influencing what projects you take on or how you pursue them? When I began to write about cross-cultural sympathies in poems from World War I, I wasn’t consciously trying to rebut the nativisms and nationalisms of our moment. But I suppose it’s inevitable that my interest in that part of the literary past was shaped partly by emergent forces that have become an even greater tide over the last couple of years. Isn’t that one of the glories of rich, complex, multidimensional poems—that they keep emitting light long after much else in their time has gone dark? It was exciting for me to re-read a hundred-year-old poem like Isaac Rosenberg’s “Break of Day in the Trenches” and see how it speaks powerfully to our own moment. When I realized that even a single word like rat crosses ethnic, cultural, and even linguistic boundaries (Yiddish, German, French, English), it felt like discovering a gem still glinting across distances of time and space. I struggled over the sentence you quoted from the end of the essay. At one point it was going to refer even more pointedly to the recent surge of xenophobic nationalism in reaction to the global flows of people, ideas, images, technologies, and such. But I didn’t want to reduce the power of the poems to any one particular moment. I felt better pluralizing “at times of,” since such times are now, then, and will no doubt recur. Tribal, ethnic, and national divisions that foment the specter of the enemy, the other, and the need for war don’t show any sign of abating. But whenever they surge into view, poems with “cosmopolitan sympathies” can help keep other possibilities legible and palpable. You’re right—scholarly time is slow. It can take so long to conceive, research, write, revise, submit, revise, re-revise, and publish. That can be frustrating. But I’d like to think that the best scholarship is true both to its own moment and to time horizons that extend well beyond our time. I was just consulting a scholarly commentary on Wallace Stevens from the 1960s, and even though it was obviously marked by its era, I was excited by how elegantly it opened up the specificities of some poems I admire. At a time when some are ready to discard literary criticism as passé, it’s important to remember that the best of it—like the literature it explores—has both contemporaneity and longevity. You steadily produce essays and books I find immensely valuable, even as you give literary service locally and internationally by editing anthologies, helping administer your academic program, judging contests, and more. How do you organize your writing life? Are you able to create feedback loops, for instance, between teaching and scholarship? It’s tough to keep a balance, but you’re right that mutual reinforcement is ideal. I love writing, and I love teaching, and I especially love it when they cross-fertilize each other. Teaching can be a marvelous opportunity to try out and test ideas—sometimes you discover an idea is bunk even as you’re uttering it. You stay abreast of which literary works speak most urgently to students. You also learn which works need more assistance getting across. Just now I’m struggling to help my students forestall premature closure on Euromodernist engagements with Asia, to help them see that poems by Yeats, Eliot, Pound, and Stevens have both orientalist and anti-orientalist dimensions. I couldn’t be doing that if I hadn’t been working through those complexities in my writing. Sometimes teaching and writing don’t rhyme, of course, but that can be good too. Many of us have had lightbulb moments when we’re extending ourselves into an area completely irrelevant to what we’re working on. As for editing anthologies and judging contests, those are also examples of feedback loops. Having written a book on postcolonial poetry helped me to expand the reach of The Norton Anthology of Modern and Contemporary Poetry, but the loop also looped the other way: the transnational reading necessary for the anthology helped lay the groundwork for arguments in A Transnational Poetics. Poems and poets I’ve fallen in love with when judging contests like the National Book Award have also figured in my scholarship. As we all know, in the face of our immediate obligations to teaching and to local, national, and international service, let alone to family and health, it’s easy to lose track of the solitude and slow time we need for reflection. But at least for me, that’s the fuel for my best work. I try to stake out at least a little space for the creativity of writing even amid the professional frenzy. I’m happiest when my intellectual work is growing and is challenging me to grow. The added stimulus of the exchange of ideas in the classroom and in talks elsewhere is also invaluable for keeping those emerging ideas in dialogue with our moment. I’m writing a book about poetry in a global age, from the First World War poets to the contemporary. It approaches poetry and the global from a number of different angles—poetry and war, poetry and tourism, poetry and locality, poetry and the environment, and so forth. As in A Transnational Poetics and Poetry and Its Others, I’m continuing to try to erode the partitioning of modernist and postcolonial, Western and non-Western literatures, without eliding their differences. I’m placing modernists like Yeats, Stevens, Eliot, Marianne Moore, and Lorine Niedecker side by side with postcolonial writers like Lorna Goodison, Daljit Nagra, Arun Kolatkar, Karen Press, and Agha Shahid Ali, and them in turn side by side with post-45 poets of the global North like Bishop, Larkin, Heaney, Cathy Park Hong, and Terrance Hayes. I’m thinking about the overlapping but distinct ways in which they imagine and map place, criticize tourism while implicating themselves in it, and code-switch and code-contrast various languages. It’s important for me to explore postwar poetry from across the anglophone world, while also revaluing and rethinking the canonical modernists. That dual commitment is also reflected in my ongoing work as an editor in books like The Cambridge Companion to Postcolonial Poetry (2017) and The Twentieth and Twenty-First Centuries of The Norton Anthology of English Literature (2018). I’ve also recently been working on Persian poetry, which I heard a lot growing up and first learned to read in graduate school. The intensification of anti-Muslim, anti-Iranian xenophobia and my Iranian-born father’s recent death no doubt propelled that interest. The massive significance of poetry in Persian culture, as across much of Asia, is also helping me to rethink the idea of “world literature,” an area largely dominated by the novel. Once you bring poetry to the fore, you realize world literature needs a more nuanced model than either the gains-in-translation paradigm or the untranslatability thesis. Taking some cues from Pound and examining Persian, English, French, Latin, Hmong, and German examples, I’m exploring how such poems are phanopoeically translatable in their imagery, yet language-specific in their melopoeia and their logopoeia. That Persian interest is also helping me to look with fresh eyes at some of my longtime favorites, such as Yeats, who turns out to have been influenced not only by Irish and English models, nor only by Indian and Japanese, but also by Persian, as mediated by Byzantium. It seems important to continue to excavate the profound impact of non-Western aesthetics on Euromodernism. I’m also exploring other ways of conceiving the globality of other canonical modernists. Wallace Stevens, for example, seems to me to exemplify what eco-theorist Timothy Morton calls “the ecological thought,” an apprehension of human-nonhuman enmeshment on a planetary scale, as in later poems by writers like Jorie Graham and Juliana Spahr. More broadly, I’m trying to help develop ways of conceiving the multidirectional, multidimensional migration of both fixed and open poetic forms, in contrast to unidirectional, distant-reading models that risk missing the creolizing interaction between the local and the imported. The challenge is to fashion a critical method that’s sufficiently historical and transhistorical, local and global, micro and macro for the forms, intricacies, and exhilarations of modern and contemporary poetry.